NOTE: Knife is not included. Custom leather knife sheath/holster/case with belt loop. This very small custom case was especially designed to fit the little B 505 Knife but will work with any small pocket knives that measure approx. 2 7/8" Long X 5/8" Wide X 1/4" Thick. For a slightly larger case see the 55 listing. 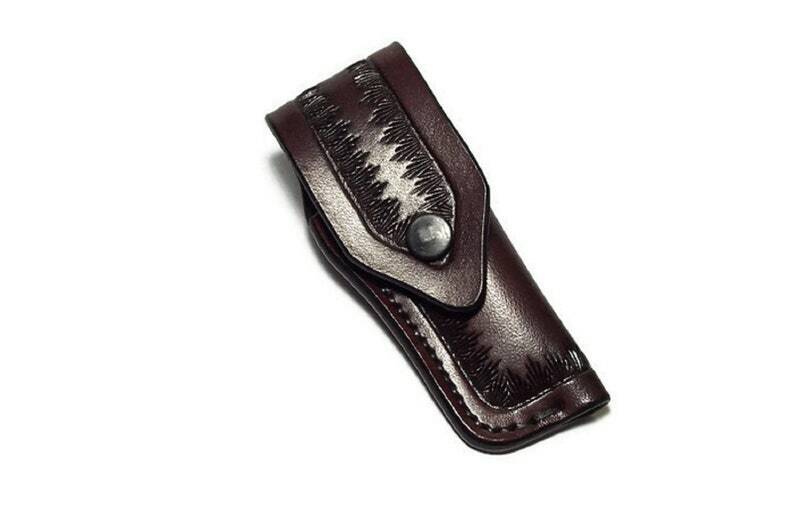 Features: Premium carving leather construction, closure flap with snap, hand tooled grass border design, recessed hand stitching, and stitched 1 1/2" belt loop. Available in Black, Chocolate Brown, Mahogany (shown), Saddle Tan, or Natural Leather w/natural edging and Natural w/black edging. A color chart can be found by scrolling through the photo's. Can be ordered without belt loop or different/without tooling if desired. Also available right or left handed on the belt at checkout. Recessed hand stitching is guaranteed for the life of the item. This item is made as ordered and takes 2-3 weeks to ship. Built to last. Quality made in the USA !